Initial access is granted by navigating to the page to be edited and clicking on the DirectEdit link. The DirectEdit link is the copyright symbol found in the footer of each web page. 1. Click on the DirectEdit link. 2. Sign in to the USF CMS using your NetID. Users must have been granted editing access to the page to be modified in order to access it. If you log in from a page that you do not have access to edit, then you will receive an error message alerting you that you do not have the appropriate permissions. 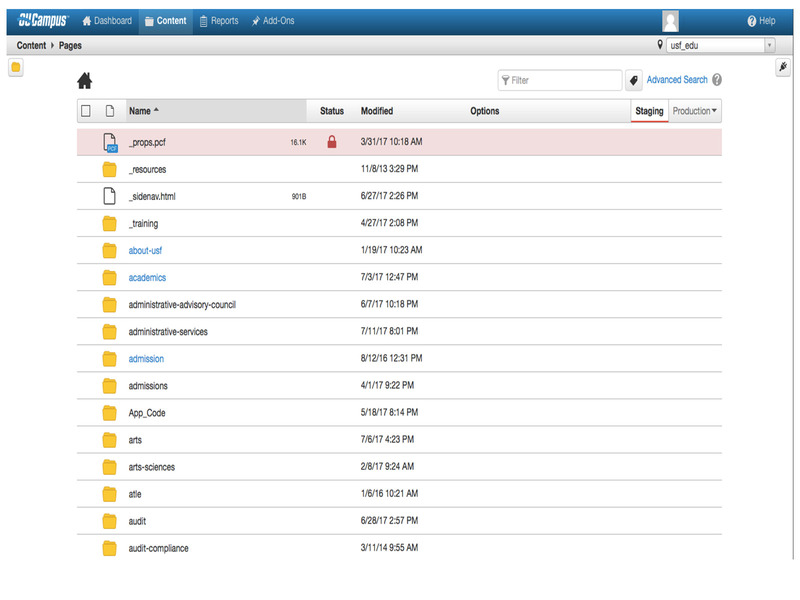 However, you will still be within the CMS and can navigate to your unit's directory from there. The Dashboard provides a location within the USF CMS where each individual can access user specific messaging and gadgets. 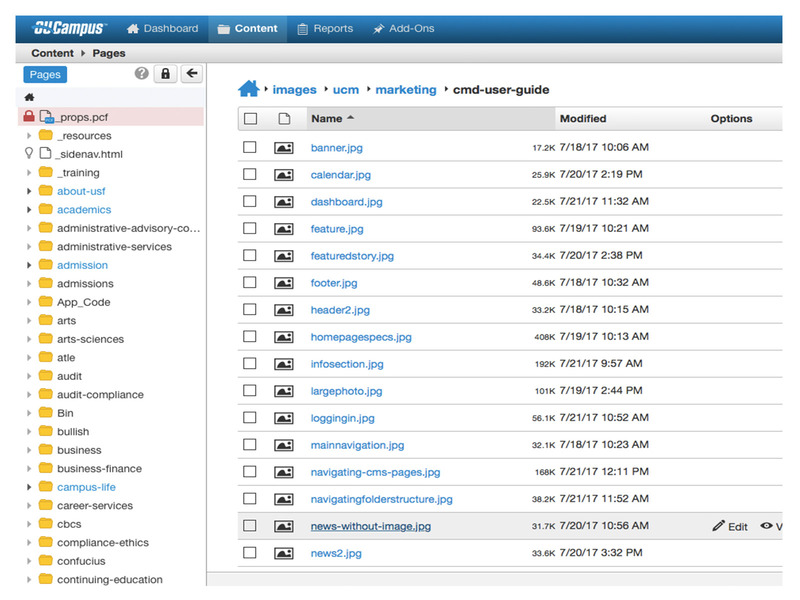 Quick links are provided to the Work ow and Inbox screens of Mailbox, which are also accessible from the Dashboard menu. The Dashboard can be customized by each individual user by choosing which gadgets to show or hide in the view (custom gadgets coming soon!). The Workflow list view shows content that is waiting for your approval or content you have sent for approval and are separate from other messages, which can be viewed in the Inbox and Sent. Content within an approvals process can be tracked using this screen. Inbox displays messages from other users as well as automated messages associated with scheduled actions, such as a notification of scheduled publish or notification of page expiration. The Inbox Gadget is shown on the Dashboard and includes how many new messages are in the inbox. The Inbox includes a linked list of messages and the functionality to compose a message. Compose allows the user to compose a message to another user in the USF CMS. The message can be sent to the user's external email as well. This is where the majority of the work will be done. Simply use the folder structure found in this view to navigate to the various pages that need to be edited. If access to a particular folder/ directory or page has not been granted, the folder/directory or page will show up as plain black text instead of a hyperlink. When using the folder structure to navigate, users must have access to the directories/folders leading to the page to be edited in order to traverse through the structure. The breadcrumb found next to home icon at the upper-left is how to navigate backwards through the folder structure. When logged in to the USF CMS, navigating between pages and the folder structure can be easily accomplished by clicking on the yellow folder icon found at the top of the Pages view. You can lock the left folder to the screen and to the main window by clicking on the lock icon. All images should be prepared to the proper specifications and uploaded prior to creating or modifying widgets, image rotators, or homepage feature areas. All documents should be uploaded prior to linking to them within text pages. Your images and documents must be named properly prior to uploading (use only lowercase letters and numbers. Separate words and numbers with dashes). 1. From the top directory, click on the images folder. Click on your unit's folder. 2. Click on the "Test" tab (if you are uploading after your site has gone live, then skip this step). 3. Drag and drop les or click the Upload icon. 4. If Upload, click Add Files to browse to the image(s) you would like to upload or drag and drop the file(s) from your computer. 1. From within your unit's directory, click on the documents folder. 3. Drag and drop or click the Upload icon. 4. If Upload, click Add Files to browse to the document(s) you would like to upload or drag and drop the le(s) from your computer. Note: Uploaded images and documents do not appear on the Staging tab.To view les that you have uploaded, click on the Test or Production tab. Once the page to be edited has been identified, it will need to be checked out. Keep in mind that a lit (yellow) light bulb indicates that the page is checked out to you, the logged- in user. Only one user can have a page checked out at a time, and only the user to whom the page is checked out or an administrator can check a page back in. Pages are marked as "checked out" when they are locked to a user. Only one person can check out a page at a time. When the page is checked out to a user, no other users, including administrators, can make changes to the page. This includes publishing the page. The only options users will have, other than the one who has the page checked out, are "Preview," checking the "Log," and setting "Reminders". Users should check in pages they no longer need. Publishing pages will also check back in pages. There are multiple reasons that a page will appear as checked out to a user, and there are different indicators to help make clear why a page is marked as checked out, and whether or not the page is checked out to another user or the logged in user. From within the folder structure view, the indicator for the status of a page in the work ow, including whether it is checked out or not, is found under the Options column. After accessing the page to be edited and checking the page out, one of two options will appear: 1. An orange MultiEdit button at the top of the page. Clicking on an orange Multi Edit button will open a form to be completed. A green Edit button, indicating the editable regions. Only areas that are available to be edited will appear with a button. Clicking on a green Edit button will open a What You See is What You Get (WYSIWYG) Editor. Keep in mind that part of the configuration of the template design may include an image in the background of the WYSIWYG Editor that helps present a more accurate rendering of how the content will appear on the page, but it may not be reflective of what the current page actually looks like, both in terms of the content on the page and possible widgets that may have been turned on or off. It is meant simply for visualization purposes and to help understand how the content will actually be laid out on the page. Editable areas vary by template design and permission levels. To change Section Title, Banner Title, Banner Subtitle, Main Navigation and Footer, and to add Drop Down Navigation. 1. Navigate to your homepage directory and select the "_props.pcf" file. Click on the "Properties" button in the page options at the top of the page. 2. Edit the desired areas. 3. For Main Navigation links, click on the document icon, navigate to and click on the page you wish to link to. You may also enter in the URL manually (use relative URLs for pages within the USF CMS. 4. For drop down menus, click on the document icon for "Sub Navigation", navigate to and click on the "_sub.nav.html" file you wish to include. Sub navigation files need to be created and published prior to selecting them here. 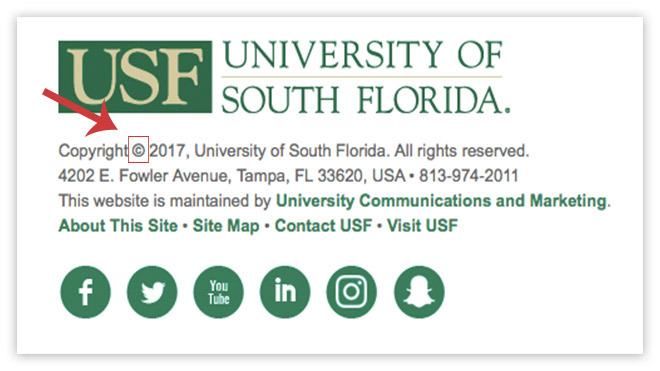 Please refer to USF System Policy 0-206, Digital Communications for scope of official external and internal USF System websites. All official USF System sites (both internal and external) as outlined in USF System Policy 0-206, are required to migrate in to the USF content management system (CMS) (external) or the Portal (internal) and must use the templates provided. These sites are subject to review and approval by University Communications and Marketing (UCM) and Information Technology (IT) prior to launching. UCM and IT reserve the right to review launched sites periodically for quality assurance. If you feel that your unit requires features not currently part of the standard templates for either the CMS or the Portal, please email webservices@usf.edu. In your request, you must provide the reason that you feel your unit requires custom templates. Custom requests will be considered by UCM in consultation with IT Web Services and exceptions may or may not be granted. Depending on the scope of work, custom development may be subject to a fee if approved. All USF template code is the property of UCM and IT. The code seen in a source code view IS NOT, and MAY NOT be used as, a template. You may not use this code, a reverse-engineered version of this code, or its associated visual presentation in whole or in part to create spin-off work. You may not override stylesheets without the prior approval of UCM and IT. Applications, databases, and online forms will not migrate to the CMS or the Portal. However, they are required to adhere to the branding of the official templates created by UCM. Separate template files will be provided by IT Web Services on a case-by-case basis for units that have their other content within the CMS. These files are provided with the expressed intent to use only for the applications, databases, or forms that have been identified. They may not be used in any other way and follow the modification terms listed above. All USF websites that have been given permission by UCM and IT to live outside of the USF CMS or Portal (i.e. applications, databases, and online forms) must comply with state and federal accessibility standards. Separate template files will be provided by IT Web Services on a case-by-case basis. These files are provided with the expressed intent to use only for the application that it was given. They may not be used in any other way and follow the modification terms listed above.